Nevada maps from Omnimap Map Store: 250,000 travel maps, hiking maps, topo maps, and more. Nevada State Raised Relief Map. Nevada Sectional Raised Relief Map. Nevada Road and Recreation Atlas. 1:280,000. Benchmark Maps. Nevada has long been known as the wildest adventure state in the lower 48, and this atlas is the first atlas to fully corral all of its marvels and outdoor potential. Careful and thorough field checking and local research assure users the best Nevada outdoor experience possible. Recreation maps show hunting units and public lands, emphasizing historic trails and points of interest. Sample detail from the Nevada recreation atlas. Nevada Topographic Atlas & Gazetteer. DeLorme. Excellent atlas using USGS topographic maps. Ideal for hikers or backroad enthusiasts. Nevada Recreation Maps. 1:792,000. GTR Mapping, 2009. Also includes all of Death Valley National Park. Detailed travel map - Interstates, most exit numbers, highways, many (not all) local roads. Topographic contours each 1,000 feet. Color shaded each 2,000 feet above 6,000 feet. Features include national forests, wilderness, campgrounds, parks, national conservation areas, wildlife refuges, state wildlife management areas, ski areas, mining districts, points of interest, and more. Sample detail from the Nevada recreation map. $4.95 62-80902 1 sheet, folded. Nevada Road and Recreation Map. 1:950,400. Benchmark Maps. Benchmark's Nevada Road Map is the ideal portable planning tool and GPS companion for fast statewide travel. It's the only Nevada road map that benefits from Benchmark's extensive field-checking, proven accuracy and cartographic excellence. Beautiful shaded-relief road map of Nevada is on one side including mileage chart and placename index. The reverse side shows the urban regions of Las Vegas, Reno, and Carson City & Tahoe. Nevada Road Map. Rand McNally. The map has clearly labeled Interstate, U.S., state, and county highways; a mileage chart and a Mileages & Driving Times Map; indications of parks, points of interest, airports, county boundaries, and more; easy-to-use legend; and a detailed index. Detailed inset maps include: Carson City, Lake Mead National Recreation Area, Lake Tahoe Region, Las Vegas, Las Vegas Strip, Laughlin, and Reno. Map size, unfolded, is 25 x 37 inches. $5.99 62-8090 1 sheet, folded. Nevada/Utah Easy-to-fold™ Road Map - laminated. Rand McNally. The durable and convenient Nevada and Utah EasyToFold state map will take all the wear and tear your journey can dish out. The heavy-duty laminated design allows you to mark your route, make notes, then wipe the surface clean for further use. This is a must-have for navigation whether you're a state resident or just passing through. Double-sided, size is 18 x 17 unfolded. $7.95 62-80904 1 sheet, folded. Nevada City Maps - paper. Various publishes. Folded paper street maps. Thumbnail of the Reno street map. $6.99 62-8092L North Las Vegas & the Strip street map. (Rand McNally). $8.95 62-8092LAS Las Vegas street map. (ITMB). $6.95 62-8092LP Las Vegas Pop-out street map. (Popout). A pocket-sized "pop-out" folded map covering the main tourist areas of the city. $6.95 62-80921LP Las Vegas Popup street map. (Van Dam). A pocket-sized "pop-up" folded map covering the main tourist areas of the city. Similar do above but by a different company. $5.95 62-8092RE Reno & Sparks street map. 1:28,000. (GM Johnson). Nevada City Maps - waterproof. Various publishes. Folded waterproof street maps. 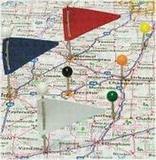 "Laminated" indicates a paper map that has been laminated to make it water-resistant. "Waterproof" indicates a map printed on synthetic water-resistant and tear-resistant synthetic paper such as tyvek&tm; or polyart&tm;. $8.99 62-8092LVG Las Vegas Family Map. Waterproof. (Franko's). A map highlighting a family approach to Las Vegas, not just the casinos. $8.99 62-8092LVS Las Vegas Strip Map. Waterproof. (Franko's). A map highlighting the casinos and entertainment along "The Strip". $9.95 62-8092LF Las Vegas City Map. Laminated. (Borch). $7.95 62-8092LM Las Vegas City Map. Waterproof. (MapEasy). Nevada City Street Atlases. Various publishes. $19.95 62-80922RE Reno/Tahoe Street Atlas. Spiral-bound street atlas. (Rand McNally/Thomas Bros.). We offer wall maps for Carson City, Greater Las Vegas, Henderson, Las Vegas, North Las Vegas, Paradise, Reno, Sparks, and Spring Valley. Sample detail from the Reno wall map. We stock cycling maps for the "Western Express" long-distance cycling trail across Nevada. We stock a selection of fishing maps for Nevada. 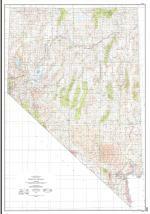 We stock all USGS topographic maps of Nevada at all available scales. Nevada National Forest Maps - click here. U.S. Forest Service. 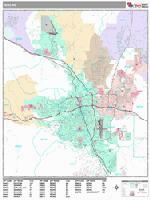 We stock all available USFS maps for Nevada. Click here for sectional raised relief maps. Nevada State and County Wall Maps. Intelligent Direct. 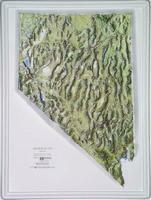 Nevada Shaded Relief Wall Map. 1:500,000. Raven Maps. Although Nevada is known for being the home of Las Vegas, it also has grassy valleys, rugged, snow-covered mountains, alkalai flats, and open sandy deserts. The beautiful glacial Lake Tahoe lies on the California border, and over 150 mountain ranges dominate the rest of the state. Elevations are represented by color, and this, in combination with our relief shading technique, gives the map a 3-dimensional look. Size is 106 x 155 cm (42 x 61"). Nevada Topographic Wall Map. 1:500,000. USGS. Map size is 45 x 66 inches (114 x 165 cm). Thumbnail of the Nevada topographic wall map. Sample of the detail of the Nevada topographic wall map. Nevada Magnetic Anomaly Map. 1:1,000,000. NBMG (M93A). Nevada Bouguer Gravity Quadrangle Map. 1:250,000. 1984. NBMG (Bulletin). These maps show gravity contours at 5-mGal intervals with terrain corrections. The data are plotted on a geologic base map. Sheet size is approximately 91 x 56 cm. Please specify area of interest. $17.95 62-8013B Death Valley (M-69). Nevada Industrial Minerals Map. 1:1,000,000. 1973. NBMG (M-46). This map locates the industrial mineral deposits of the state. Map size is 80 x 82 cm. Nevada Geologic County Maps. 1:250,000. NBMG (Bulletin). Each map sheet illustrates the geology of the county, and comes complete with an extensive explanatory text. Being discontinued, limited stock left. $29.95 62-8055N Pershing Co. 116 pp. $3.95 62-1000NV Nevada flag, small. Size 4 x 6 in. $9.95 62-1001NV Nevada flag, medium. Size 8 x 12 in. $37.95 62-1003NV Nevada flag, large. Size 2 x 3 ft.